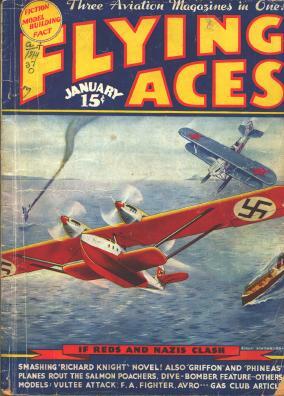 This is the cover of the January 1937 issue of FLYING ACES magazine. The cover illustration is for the story "IF REDS AND NAZIS CLASH". The article behind the cover illustration discusses the importance to the Nazis of taking Poland to gain access to the important Baltic Sea port of Danzig. The Nazis would then use Poland as a stepping stone to take Russia with its great reserves of timber, minerals, and especially petroleum. If it could be seen so clearly in January 1937, a full FOUR and a HALF YEARS before it happened, why wasn't anyone ready?